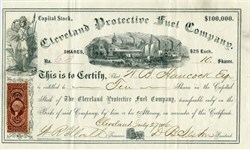 Beautiful stock certificate from the Cleveland Protective Fuel Company issued in 1866, This historic document has an ornate border around it with a vignette of standing native American woman at left, harbor and dock scene in middle. Sanford & Hayward's Printer. This item has the signatures of the Company’s President and Treasurer.